The Blessed Hope and other artwork by artist Nathan Greene can be viewed in our artist slideshow. The Blessed Hope by artist Nathan Greene and other Nathan Green art, art work, artwork, canvases, giclees, images, limited editions, open editions, paintings, paper, pictures, posters, and prints can all be found at Christ-Centered Art. The Blessed Hope captures the emotion and joy of the moment when Jesus the Messiah returns for His Bride as mentioned in Titus 2:13. The graves open up as the dead in Christ rise first, then all who are still alive meet Christ in the air with the host of heaven. 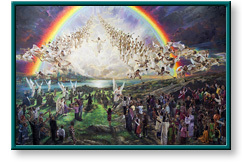 The explosion of light and color set against a dark sky framed by countless angels reminds us that this world is not our home and that our hope and trust in the Lord's coming to take His people home to heaven will soon be realized. Add $2 for shipping & insurance. This unframed open edition paper print includes the following caption on its reverse and can be framed or used as a postcard. This unframed limited edition paper print comes mint in its original folio, includes a genuine certificate of authenticity from Hart Classic Editions, and is individually numbered and hand signed by the artist Nathan Greene. Image Size 17.25" x 25.5"
This unframed limited edition canvas print comes mint in its original packaging, is stretched, has a genuine certificate of authenticity from Hart Classic Editions, and is individually numbered and hand signed by the artist Nathan Greene. Image Size 29" x 43.5"
This unframed limited edition canvas print comes mint in its original packaging, is unstretched, has a genuine certificate of authenticity from Hart Classic Editions, and is individually numbered and hand signed by the artist Nathan Greene. The Blessed Hope by artist Nathan Greene as well as other open and limited edition contemporary biblical and medical art prints and canvases, giclees, images, lithographs, paintings, pictures, posters, and reproductions by renowned Hart Classic Editions artist Nathan Greene can be viewed and purchased at special sale prices at Christ-Centered Art.